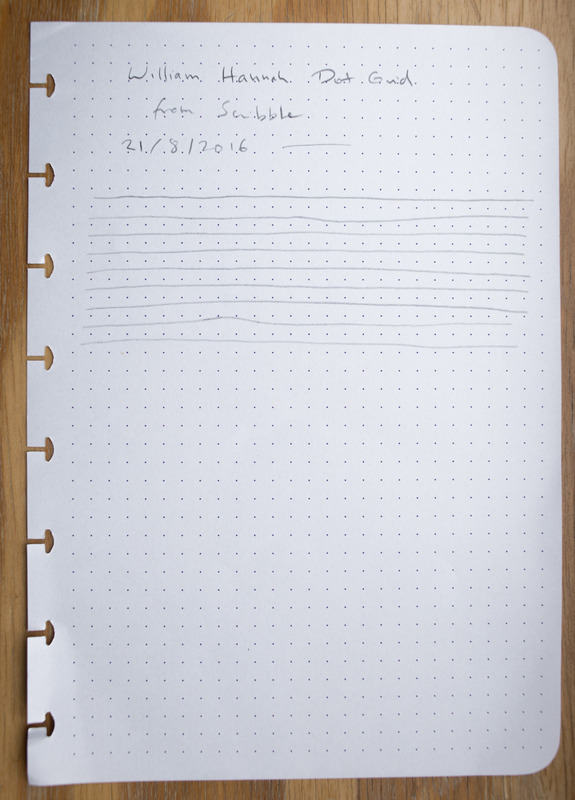 A few weeks ago Scribble sent me a sample paper pack containing paper sheets from many different companies, all carefully prepared (‘hole punched’ and the corners rounded) so that they can be used in Atoma, William Hannah or similar disc bound notebooks. On more than one occasion I have stated how good Atoma’s paper is. It is basically in a class of its own – but with United Inkdom having a closer look at William Hannah’s notebook I thought it might be worth having a closer look at the paper that comes with the William Hannah notebook – different sheets of W.H. paper were part of Scribbles sample paper pack. Let me start by saying that the William Hannah paper is rather unusual, at least the dot grid version is: It contains printer steganography. The best reason for this I could come up with is that the paper is prepared (cut, punched and the corners rounded) in very small batches. So small that consumer printing equipment might have been used to print the dot grid pattern. That would explain the yellow dots from the printer steganography as well as the fact that the purple used for the purple dots is made up of red and blue areas, i.e. the colour is mixed.1 The dots are also reflective, like colour laser printed documents, unlike inkjet printer printed documents. Regarding the printer steganography: you can certainly see repeating patterns. I don’t have the time at the moment or I would try to decode the pattern using the EFF’s instructions. I find the paper to be of good, but not exceptional quality. In terms of darkness and roughness it seems a tiny bit worse than the good Boise Offset Smooth 50#T “Whitewash” white paper you can find in the Field Notes County Fair edition, but it is certainly no match for Atoma’s paper. If I had a William Hannah notebook I’d be happy with the paper that comes with it, just to keep things simple. It is good paper, but depending on how happy you are to go the extra mile it might be worth experimenting with refills from other brands. 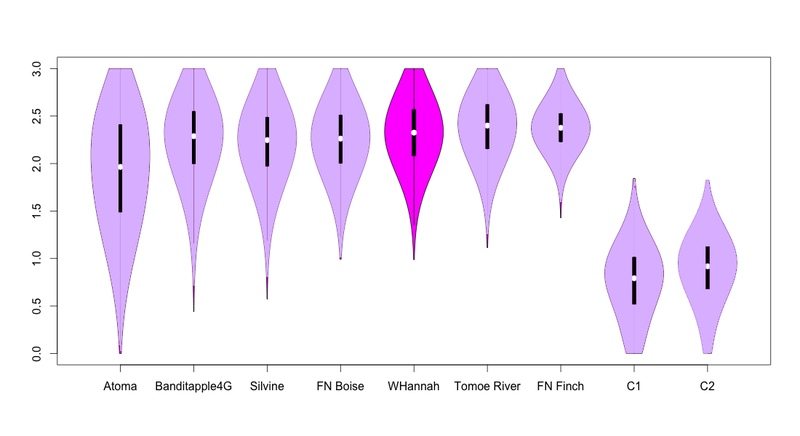 The violin plot was done using the same parameters (1.5 Newton force, etc) as the paper comparison in this blog post. You can read more about William Hannah at United Inkdom and Scribble’s blog. Atoma’s ruitertassen notebook, which is similar to William Hannah’s notebook can be seen in a previous blog post.